Seems like every day I am running, running, running. Although it often feels like I am running in place. This morning as I was tackling my TO DO list I thought about friends and what in the world would we do without them. When I ran across this photo it made me stop, take a deep breath, smile, and think about all of you who have become my friends. We are all different, and yet we have so much in common. The best part is we add color to each other's worlds. 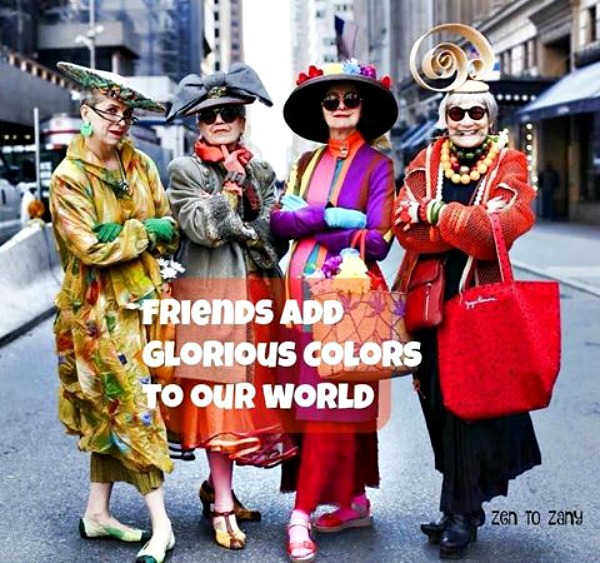 I am so happy to have each and every one of you in my colorful crazy world. Friends make my life so much happier and it's good to know they are there for us! And I wouldn't know what to do without you, friend! So true. Love my online and in person friends. Nothing like a cherished friendship. Have a great week, Laura! Love this pic... Have a great week. Yes, I couldn't agree more. We are all different yet also the same. I think that's my favorite part of blogging. The friendships we make are so special. I love the cute pic you found too.